Everything for cleaning, shooting, displaying, and customizing your revolver. Including holsters, gun belts, grips, stocks, and display cases and stands. Spare blackpowder and conversion cylinders for shooting .45 LC, 45 APC, and .38 cal Cowboy loads for Pietta and Uberti. This is a Kirst Mason Stainless Steel Ejector Assembly, it is Spring Loaded and is a modern alternative to the Original Factory Ejector Assembly. Click the "Full Description" for additional information and "Caution" statement. In honor of the Pony Express, this custom engraved pistol display box from Old South Firearms comes with an engraved 1851 revolver and replica Pony Express badge See " More Info" for details. Convenient reloads for cowboy action shooting. Holds 20 rounds for quick reloads. 9.5" long. Great alternative for black powder conversion shooters. See "More Info"
In honor of the Pony Express, This custom engraved pistol display box from Old South Firearms features a solid wood top, a compartment for your single action revolver and four additional compartments for accessories. See " More Info" for details. This custom engraved pistol display box from Old South Firearms features a solid wood top, a compartment for your single action revolver and four additional compartments for accessories. See " More Info" for details. This "Gated" Stainless Steel conversion cylinder will convert your 1858 Remington Uberti to .45 (Long) Colt. Please click on the "More Info" button for additional information and to read the Caution Statement provided by the manufacturer. 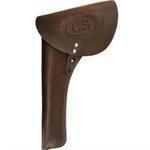 Brown CS embossed Cavalry flap holster worn on Right side for left hand cross draw. Fits up to .44 Cal. percussion revolvers with up to 8" barrels. 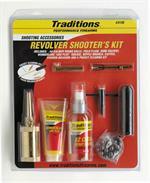 Revolver Shooters Kit, all the essential accessories you need for shooting and cleaning black powder revolvers. This Howell Conversion Cylinder will allow you to convert your 1863 Remington Pietta Pocket .31 cal. percussion revolver to a five shot .32 S&W cartridge shooting firearm. 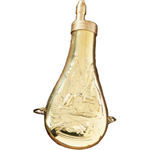 For more information and to see quantity in stock, click the "More Info" button. This rear-loading Conversion Cylinder assembly will convert your 1851 & 1860 .44 Uberti to a .22 caliber six shooter. Get more enjoyment from your revolver by having more options. Please click on "More Information"
This engraved pistol display box features a solid wood top, a compartment for your single action revolver and four additional compartments for accessories. See " More Info" for details. This "Gated" Stainless Steel conversion cylinder will convert your 1858 Remington Uberti to .45 ACP. Please click on the "More Info" button for additional information and to read the Caution Statement provided by the manufacturer. This conversion cylinder will allow you to convert your 1858 Remington Uberti .44 cal. percussion revolver to a five shot .45 LC cartridge shooting firearm. For more information and to see quantity in stock, click the "More Info" button. Pietta Model 1858 New Army Buffalo Black Powder Revolver Shoulder Stock. Convert your black-powder Pietta Model 1858 New Army revolver into a compact carbine with a removable shoulder stock to steady your aim. See "More Info" for details. Our Old English style walnut display case is "Made in America" and has partitioned compartments for gun, flask, bullets and mold. Custom built for your Buffalo and Bison black powder revolvers with 12" barrels. See "More Info" for details. Black Cavalry flap holster worn on left side for right hand cross draw. Fits up to .44 Cal. percussion revolvers with up to 8" barrels, flap has no embossing. Old South Firearms performs custom and stock engraving, this is actual deep cut tool engraving. 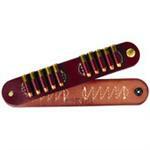 Choose from our selection of engraver ready line-art or have a graphic prepared especially for you. See "More Info" for samples, details, and pricing. This conversion cylinder will allow you to convert your Ruger Old Army.44 cal. 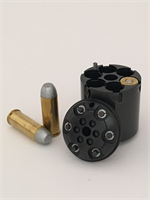 percussion revolver to a six shot .45 LC cartridge shooting firearm. For more information and to see quantity in stock, click the "More Info" button. Brown Cavalry flap holster worn on left side for right hand cross draw. Fits up to .44 Cal. percussion revolvers with up to 8" barrels, flap has no embossing.